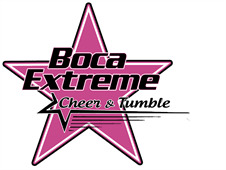 Welcome to Boca Extreme Cheer Company! Please complete the following registration form. I am fully aware that any activity involving motion, height, or athletic activities creates the possibility of serious injury, and I further agree to hold Boca Extreme Cheer Company, LLC and its staff, officers, or representatives harmless for any injury or resulting expense(s). I release and discharge all rights and claims against Boca Extreme Cheer Company, LLC and its parties. Boca Extreme Cheer Company, LLC strives to provide a maximum in safety procedures and guidelines, and cannot assume responsibility for any accidents, injury, or illness that may occur. Boca Extreme Cheer Company, LLC highly recommends that all athletes have their own health insurance coverage to help cover costs of any injury/illness. I authorize Boca Extreme Cheer Company, LLC to use photographs, video, and/or other likenesses of myself or my child for use in its promotional materials or sales and waive any rights of compensation or ownership thereto. I have read, understand, and agree to this acknowledgement of policies, risk and waiver of liability and I voluntarily affix my name in agreement. All athletes must have an updated registration form on file. Athletes are expected to be on time and may be turned away from class if they are 10-15 minutes late. It's hot! Please bring water. Water/Snacks are available for purchase. Chewing Gum is not allowed in the gym. Athletes should be picked up promptly after class unless other arrangements have been made.